Redefining road trip, Seoul travels to the South Pole to take on Frozen Division champion Antarctica in the first round of the ATL eastern conference playoffs. Penguins coach TIME makes the call on rules. Seoul is in for a bit of a weather change at The Igloo, but Suns coach CandyCanes has experience in the North Pole and isn't worried about his club. The winner plays the victor of Buffalo vs. Washington. Let's get it on Seoul Man! CandyCanes... North Pole... I see what you did there. In addition, the Seoul team has brought several barrels of spicy kimchee, which they will feed to Antarctica. Every single person on my team suddenly feels that they are about to have the best stretch of their career. Also, I hired a hitman to get Jabbar. You must have forgotten that Penguins love to eat stinky stuff. In the event this happens and the food runs out, I vote now that we eat the pilot first. Paul handling the ball like this with the same spacing. We use a Princeton style offense, where we use good offense to fuel our defense, and we rely on good ball movement. Also, even if our offense isn't smooth, our defense is still excellent. Ron Artest guards Bobby Dandridge, Chris Paul guards Isiah, and Stackhouse guards Reggie Miller. Ben Wallace and Dwight Howard clog up the lane as well as guarding their opponents, Brand and Jabbar. Our closers are rested because we give them breaks during the game, with our powerful bench taking over. We play the game like we did all game, and get rebounds easily with the twin towers of Wallace and Howard. Chris Paul, Ron Artest, and Jerry Stackhouse are all clutch. I anticipate that Kareem Abdul Jabbar will try to shoot over Wallace and Howard with his stupid Skyhook. We will stop this by having Ben Wallace sneak over to the weak side and double team him. Once he goes up for a skyhook, Howard will utilize his incredible wingspan, jumping as high as possible to contest it. If this doesn't work, we may put Chandler at the Power Forward. I assume they will have Isiah Thomas go right at Chris Paul, assuming that he can handle him. However, Isiah isn't fast enough to get by Chris Paul on the offense end, and gets burned on defense, eventually getting into foul trouble. I don't see Reggie Miller being able to score on Stackhouse. Stackhouse just needs to stay near that volume shooter, he won't be able to get in the lane, and as long as Stackhouse closes in on him and contests the shot, Miller can't be a threat. Also, Miller gets burned by stackhouse time and time again down the court. If Miller gets too close to him, Jerry blows by him. If he gives him space, Jerry hits a jumper. Ron Artest shuts down Bobby Dandrige, enough said. Bobby Dandridge isn't a threat, if he gets by Artest, he'll be blocked by our twin towers. If our plan doesn't work, then we'll go completely offense, bringing in Jefferson for Wallace, and Ricky Davis for Ron Artest. If someone fouls out, we just go to our bench. I win because I have the better team. They won't be able to get past out defense, and they won't be able to stop our offense. Also, we are clearly the more athletic team. We have more athleticism at every position. Since these are old school rules, don't be surprised to see a few of their players being outmuscled and falling to the ground. If this were a bodybuilding contest, we would easily win. Antarctica brings to the ATL 2008 Playoffs a team with dominant talent, team balance, and a championship mentality and attitude. The issue of dominant talent in an all time league of greats is defined by whether a team has a player or players who stand out even among the greats. Antarctica features two such players in Kareem Abdul-Jabbar and Isiah Thomas. Kareem is arguably the best big man of all time. This season was his most dominant. Statistically, only one season in history exceeds it (Wilt’s 50ppg / 25rpg anomaly). Kareem is at his athletic peak this year, and scored at will on everyone including a defensive monster in Wilt. No center has scored 35ppg since. Kareem’s skyhook scored over Wilt and Nate Thurmond… he will have no problems scoring over 6’10” Dwight Howard. Isiah “Zeke” Thomas is a rarity in the land of giants. He was able to dominate the game at 6’1”. He did so with amazing quicks, unsurpassed ball skills, and the killer instinct that only a few possess. Only Harlem in the ATL has a pair close to Cap + Zeke. Dominance can be weakened if the surrounding players bring competing skill sets to the table. The remaining starters are perfect complements to our big two. Reggie Miller gives us the perfect third option who will space the floor for Kareem to work. Reggie doesn’t need to be open to drop bombs from three, but he will get open looks as Seoul scrambles to adjust to Kareem and Isiah. Bobby Dandridge and Elton Brand bring two way impact and underrated team contributions. I like Seoul’s team. They have potential... if they were playing in the NBA rather than the ATL. They are just not ready for primetime in an all time league. They have a top ten point guard in this league in CP3 and they have two outstanding defenders in Wallace and Artest. They have the best frontline in the league… if this were a bodybuilding contest. The rest of their players are nice, but in over their heads in an all time league. Their biggest problem is that none of their players has ever won a ring! (Ben Wallace won a ring in a later season). Seoul has a problem on defense against us (this will be a recurring theme). Unlike Seoul, we will not struggle to find ways to score. Our only problem will be deciding how we want to score each time down the court. We chose Old School rules for one reason: Kareem Abdul-Jabbar. No zone means the most lethal weapon in the history of basketball is in its element. All five of our starters are capable, high percentage, high efficiency scorers, but Kareem is our bread and butter. Captain Hook is our primary set in which we will deliver the ball to Kareem in his sweet spot on either side of the lane since his skyhook is effective with either hand. Isiah, Dandridge, and Pressey all excel at feeding the post and Kareem’s length make his high receiving hand an always available target. This does not mean that everyone is standing around during the Captain Hook set. A typical play will have Kareem setting up in the low post. Zeke will dribble midway to that side of the arc for the entry pass. Reggie will start opposite side midrange. Elton will be on Reggie’s side and set a backpack on Reggie’s man freeing him for the curl baseline or free throw line to the 3 point arc ready for a Kareem pass out. Dandridge will be on the other side from Zeke just inside the arc. Dandridge will either dive to the hoop as the attention shifts to Kareem, or be available for the ball to swing as Kareem repositions on the other side of the lane if doubled. Seoul Power sees a 1-4 set with Zeke at the top of the arc with the ball. This becomes our primary set whenever Kareem sits. Both Brand and Tarpley set down screens freeing Reggie at the 3 point line, or Dandridge for the midrange jumper. Zeke has the greenlight to drive the lane giving himself the three options of a layup, pullup jumper, or dish to the open man. Brand and Tarpley roll to the hoop off their down screens for Zeke alleyoops or offensive boards. UCLA Fight Fight Fight will be a specialty set to keep Seoul guessing on D. Kareem (or Brand) sets up at the high post elbow. Zeke passes to either Dandridge or Pressey the near wing position just inside the arc. Zeke then makes a quick cut past the high post screen rub of Kareem or Brand. Dandridge or Pressey have the option of feeding Zeke for the layup, taking the open J, or posting their man in the low block. Once Kareem rubs Zeke’s man, he rolls toward the basket on the opposite side of the lane trailing the cutter for a possible layoff dunk from Zeke. Pick Your Poison & Roll is a no frills clear out pick and roll. We have various options at our disposal. Zeke + Brand, Zeke + Dandridge, Reggie + Brand, Reggie + Dandridge in which our pair is given clear out space to operate on one side of the court. There are no good choices for Seoul as every player has a high percent shot and the ability to work well in tandem with their partner for either pick and pop or pick and roll. The only exception to this is Dwight Howard who has a solid % based on dunks and alleyoops. Dwight’s so called post game is still raw and awkward. His Olympic Redeem Team performance has once again exposed the sad fact that he has no move, no go to shot in the post. He was completely outplayed by Scola for instance! Man Up is a straight, no frills man to man set in which we say our defenders are better than your scorers. Prove to us that you can score on us. Kareem will swat anything Howard attempts in the post. Remember, this is a young 5bpg Kareem with springs in his legs. Dandridge will hold his own against Artest either on the perimeter or in the post. Zeke will stick like glue to CP3 and never leave him to help. CP3 has NEVER played with Zeke’s magic hand on his hip the entire game influencing his every movement. Zeke’s blanket will minimize the opportunities for spectacular CP3 over the top passes to Dwight. If Wallace looks to set a backpack on Kareem to set up Howard for the CP3 alleyoop, Elton will meet Dwight at the hoop with his 7’5” wingspan / 9’2” standing reach. Out Manned is our pressure D. Zeke will at his discretion call for Out Manned in which he will initiate the pressure full court. In this set Zeke will bring on the ball pressure and Dandridge will shadow him about 10-15 feet back to anticipate either a halfcourt line double team trap on CP3, or poach the passing lane as CP3 looks for help out of the pressure. Kareem and Brand will be positioned on either elbow of the lane as dual backstops in case the ball leaks through. Reggie will be above the arc ready to adjust to either side. Seoul’s tendency for turnovers will be exposed under the Out Manned pressure. Rescue Reggie is our special circumstance D set in which we adjust to the possibility of Reggie’s man getting hot for a stretch. The key to our rescue alignment will be Ben Wallace. With Big Ben’s anemic 7ppg, we will leave Ben during these stretches until the ball goes up on a shot. Either Brand or Dandridge will slide to give Reggie the needed help. If Brand, he will disengage the help to find Wallace for the box out on the shot. If Dandridge helps Reggie, then Brand will slide to cover Dandridge’s man in a soft blanket. Brand will back off allowing the low percent outside jumper and prevent any drive. We will close the game with our five starters on the floor. They will be well rested because none of the starters will play over their regular season minutes average. In Kareem’s case, he will actually receive four extra minutes of rest from his season average, so he will have fresh legs for the skyhook. The ball will be in Isiah’s hands and he will work a combo of our Captain Hook and Zeke Power sets which will emphasize the big shots coming from Jabbar and himself in the final minutes with Reggie spotting up on the wing for open daggers when Cap and Zeke draw extra attention. Brand and Dandridge will be available for safety valve shots, and both will be crashing the boards. I don’t anticipate the game being close in the final minutes, but if Seoul makes a final run, we like our situation compared to theirs. Who is going to take the final shots for Seoul? Looking at their roster, there is only one player I would want taking the big shot and that is CP3. Isiah will lock in on CP3 for the jumper and Bobby Dandridge will shade off Artest to help on drives. 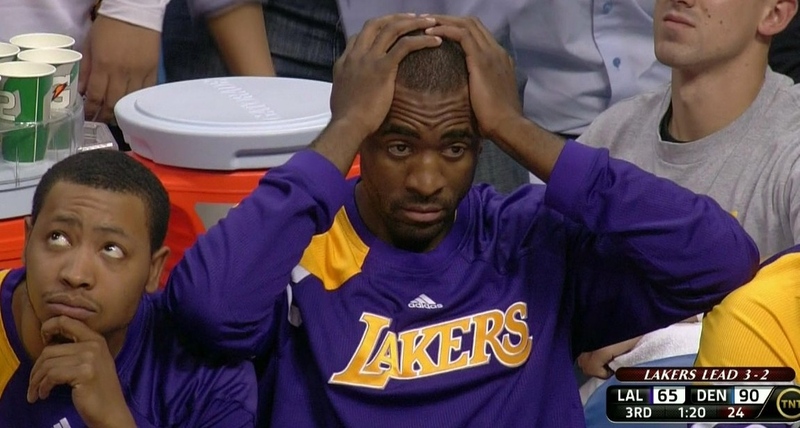 We will live with Artest jacking up .38% final minute shots. Seoul’s dilemma is that we have not one, but THREE of the all time greatest game closers in Jabbar, Isiah and Reggie. We live for crunchtime. The only issue I can see as a possibility is Isiah in some foul trouble from hounding CP3 too tightly. We want Zeke on the floor for the end game push, so we would adjust by having Paul Pressey soak up the extra minutes. Our normal plan is to have John Paxon give Zeke 10 minutes rest, but if foul trouble leads to Zeke sitting 20 minutes, then the extra ten minutes will be Pressey. Those extra minutes with both Dandridge and Pressey on the floor together give us a double Doberman punch on D. Pressey will walk the ball up and efficiently run the offence from his point forward spot. I anticipate Seoul will attempt to slow Kareem down with a double team using Ben Wallace sneaking over weakside. First, the problem with that tactic is that Kareem swings away from the arriving help in his Skyhook motion. Even if Wallace does get there in time Kareem will be rising above both Howard at 6’10” and Wallace at 6’8”. For early doubles, Kareem will efficiently find the open man. Each of my starters has a killer midrange jumper. Brand, Dandridge, Miller, and Pressey all shoot at 50% so Kareem has full confidence in moving the ball. I expect that Seoul will try to guard Isiah straight up with CP3. This has Isiah licking his chops. Zeke is simply too quick for CP3 to stay with him over the course of the game. Cancun Nick better lace them up to be ready for the extra minutes needed once CP3 begins to grab Zeke and ends up in foul trouble. Antarctica wins this game for the same reasons that some teams always dominate others throughout the history of the game. We have more talent, greater skills, a better skill set mixture for spots 1-5, and a team led by proven winners who perform at their highest levels in crunchtime. Antarctica wins unanimously, will post writeups in the morning. Kareem, Reggie, and Isiah are all tough competitors. And that Brand guy is no slouch. Offensively, they'll look to establish the post and move off the ball around Kareem. Can they handle the muscle of Artest, Wallace and Howard? Can their second unti hold the line against the Seoul bench? Offensively, this team has some nice, young parts. They've even got a cold blooded playoff shooter in Van Exel. Paul will be comfortable in the Princeton offense. He and Howard should be a good combo. Dwight's post D is put to the test against this young Kareem. Will he be able to stop Kareem and his unblockable shot? Wallace will be sent to help double, will Brand take advantage? Can Stackhouse handle Reggie working off the screens? CP3 and Isiah should also be an intriguing head to head. The road trip to Antarctica was hell. Luckily, we left a month early to get there. Of course, the plane went down several days' hike away from the arena. And, yes, we survived on the meat of the pilot, which sustained us as we finally made it to the arena for tip off. Upon tip off, Antarctica looked to establish Kareem in the post. He went to work on the right block, drawing doubles. This was extremely effective as Kareem was still able to get the Skyhook off and when he missed, Brand was a beast on the offensive glass, cleaning up shots on three occasions. On the other end, the Princeton offense opened up a couple easy scores, but the Paul/Howard two-man game was more effective -- CP3 hitting Dwight for a couple of alley oops that Kareem could only watch. Still, despite having some decent defenders, Seoul was seeing a well-rounded early attack that proved difficult to stop. They trailed by 8 after the first quarter. In the second quarter, Van Exel came to play. He's working himself to enough daylight to hit some shots and trim the lead a few points. Artest is shutting down Dandrige and working the post against him well. He still has an ill-advised shot or two, but is putting together a good game. When the starters return, again Kareem is setting the tone and the table. He's crafty in the post, drawing doubles and getting the D to collapse. Howard's post game isn't yet mature enough to give it back to Kareem on the other side. CP3 and Howard continue to work off the screen roll with some success. Still, the lead has been pushed back to 11 at halftime. In the third, Brand finds he can sag off Wallace on the D end and help deny penetration. Wallace passes up several short, open shots to reset the offense. Zeke has been setting the table for Reggie coming off screens or on an occasional drive and dish. Although putting up a good effort, Stack can't help giving up just the hair of daylight Reggie needs to get off his shot. Antarctica leads by 14 heading into the fourth. NVE, Davis and Jefferson come off the bench to spark the team. NVE knocks down two threes and one of his runners in the lane over Paxson. This run cuts the lead in half and forces a timeout and the starters to return to the floor for Antarctica. Unfortunately, NVE's minutes are limited to just 14 for the game. Although this Isiah Thomas doesn't have the championship ring, he's still more battle tested than CP3. This proves to be a big difference maker down the stretch as Isiah starts to impose his will on both Paul and the game. He hits a pull-up and goes glass off a drive. He also finds Reggie coming off screens for back-to-back threes. The lead is back up to 13. NVE is seen texting his travel agent to get him into a warmer climate for his immediate offseason vacation plans. Artest asks to get in on that. Seoul is just too young to take the next step. Antarctica wins by 17. The judges forage for some real food before the long trip back to the States. Princeton works best on a team of passers, Seoul has a brilliant passer in Paul but the rest aren’t great at moving the ball. Seoul is better off just letting CP3 dominate the ball and create for everyone else. Howard will get some slams in transition, Stack will get his on Reggie, but Ben’s lack of O allows Brand to give Kareem help on Howard and the Suns struggle to keep up offensively. They need Howard to deliver a ton of points and it’ll be tough to beat both Cap and Brand. Seoul’s defensive focus is on swatting the skyhook. Howard has the length and hops to alter some shots but not consistently. Ben comes over in a double, but that telegraphs to Kareem that Brand will be unguarded and Elton kills it in this game. There is a Kareem doubling technique that shuts the skyhook down entirely, but to get credit for that you have to mention the strategy specifically. Even if you do shut down the skyhook, TIME has money 3, midrange, midpost and a fast point that can finish as teammates. Antarctica is going to be tough as nails in these playoffs. They win easily. No contest, Antartica by a landslide, great talent, great game plan... a real threat to take it all. Easiest choice of the bunch (even moreso than 8v1). Wallace and Howard on Seoul are physical specimens that can body up with the best. However, simply "bodying up" with Kareem isn't enough. Neither player has the height or length to bother Kareems hook shots, and having to double on him leaves Brand wide open for a midrange J every time down the court (and he'll kill you with 'em if it comes to that). Reggie provides perimeter scoring, and Isiah breaks CP3 down all game long. Antarctica scores at will. On the other end, it's even more of a mismatch. With two great shotblockers starting, and a great backup in Tarpley, the Penguins can defend whatever two-man game CP tries to run with Howard, and intercept (or at least disrupt) any and all lobs. With the exception of Paul and Howard, Seoul just has a ton of low-percentage volume shooters. With not enough shots to go around, and with their having to play 4-on-5 at times (since Wallace isn't an offensive threat), Seoul will struggle to score. I thought Ron did a pretty good job on defense, but I was pretty disappointed with his offense. I was also disappointed with Stackhouse. He shot at a low percentage and played bad defense. I assumed that this guy was supposed to be a miniature Michael Jordan. It was a big mistake taking Dwight Howard over Charles Barkley, we could have really used a two way Power Forward. Taking Chris Paul over legends was a mistake as well. We were too young and inexperienced. As for me, I'm going to become a referee. I heard that there's good money to be made in Vegas... I mean.... I like Vegans. They taste good.